This edition is a softcover with spiral binding. 853 hymns, psalms, and spiritual songs. Approximately 50% of included hymns are from the 1990 Presbyterian hymnal. The remaining pieces come from former Presbyterian hymnals, other denominational songbooks, and individual authors and composers. Glory to God also contains worship aids and printed liturgies for Sunday services (including baptism and the Lord's Supper) and services for daily prayer. Complete orders of service include congregational responses, prayers, and creeds. These are the perfect resources for "green" congregations, camps and conference centers, daily prayer services, and time-pressed pastors. 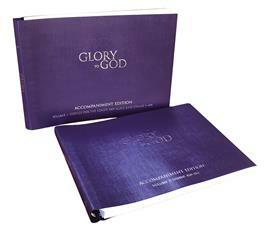 The accompaniment edition of Glory to God is available in red or purple. The red is a hardcover and the purple is a softcover.